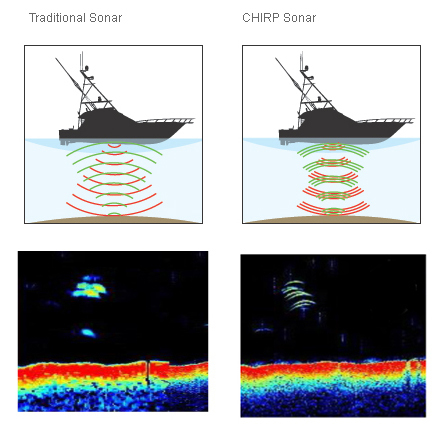 CHIRP sonar resolves images better than the traditional sonar we’ve been using for decades. Lots of us are still using sonars with single-frequency, dual-frequency or even triple-frequency transducers, which have served anglers well for about 30 years. But you’ve probably also been hearing about new technologies such as CHIRP sonar. This article will help you to understand CHIRP, and what it can do to improve your fishing and boating. Traditional sonar transmits a powerful ping, or pulse of energy into the water column at a specific frequency, then “listens” for the echoes to return. The unit’s software then processes this information to create the image of the bottom, structure and fish that you see on the display’s screen. This type of “tone burst” energy pulse may be high in power, but it is very short in duration. This limits the total amount of energy that can be transmitted into the water column. Different frequencies reveal different levels of detail. For example, a high-frequency 200kHz pulse provides excellent detail, but can’t penetrate very deeply into the water. A low-frequency 50kHz pulse penetrates deeper but reveals less detail. This is why most traditional sonars now use at least a dual-frequency or even triple-frequency transducer to provide a good combination of depth and detail. CHIRP (an acronym for Compressed High-Intensity Radiated Pulse) is a game-changing technology that has been used by the military for decades in both radar and sonar. CHIRP technology began filtering down to recreational sonars in about 2009. CHIRP fishfinders transmit a longer pulse than traditional sonar, putting more energy into the water column, with a true broadband frequency range of up to 117kHz. Instead of pinging a single frequency like traditional 2D sonar, CHIRPing devices transmit a sweeping range of frequencies. With each pulse, the transducer starts vibrating at a low frequency, which is then modulated upward to a high frequency over the duration of the pulse (130 to 210kHz, for example). A traditional sonar transmits about one percent of the time, but CHIRP sonars transmit ascending pulses that are ten times as long in duration. They put dramatically more energy into the water column, 10 to 50 times more, even though CHIRP devices often transmit at lower peak power than traditional fishfinders. 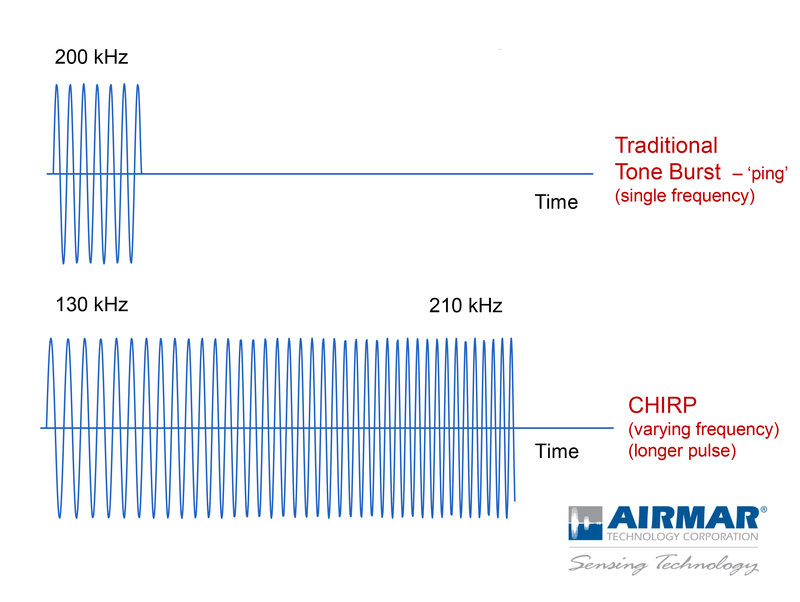 Using advanced digital pattern matching and signal processing, known as “pulse compression,” CHIRP devices receive and process dramatically more information from each pulse, enabling them to achieve unprecedented resolution and target definition. The pulse compression process, used in both radar and sonar systems, converts a long duration frequency-coded pulse into a narrow pulse of highly increased amplitude. A narrow pulse with high peak power can be correlated from a long duration pulse with low peak power, increasing the range resolution and improving the signal to noise ratio, giving the device greater ability to pull targets from the background noise. CHIRP improves bottom tracking at higher speeds and deeper depths. It helps resolve individual targets—no blobs, but instead crisp separation of adjacent objects. The result is a spectacular improvement in the image you see. View on medium CHIRP showing fishing line. Better quality CHIRP fishfinders let you see two CHIRP frequencies on screen at once. So you can sweep a broad cone on the medium frequency CHIRP band. Then, when you find something that looks good, get a closer look on the tighter-focused high CHIRP setting. How affordable are these CHIRP-enabled fishfinders, and what are the differences across the range of prices for a CHIRP sonar? When this technology first showed up on the market, CHIRP could only be found in expensive sonar modules costing a couple thousand dollars. They were made for the pros and for offshore fishermen looking for the latest technology, regardless of price. 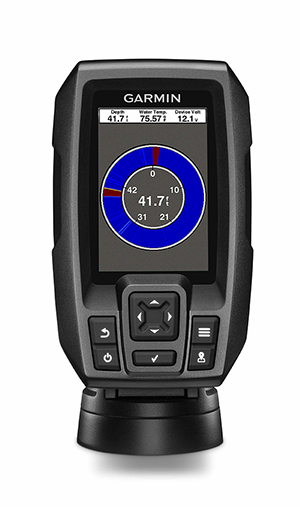 Today, CHIRP fishfinders, either sonar modules or chartplotter/fishfinder combos, are available in every price range. Garmin Striker™ 4 includes a dual beam 77/200kHz CHIRP sonar, a color display and GPS to mark your favorite fishing spots. Mid-priced CHIRP fishfinders often include a single CHIRP channel, usually with a transmitting power of 500W or 600W. Scanning sonar, enhanced with CHIRP technology, is often built into the unit and its matched transducer. You can see CHIRP, side-scan and down-scan sonar, all on the same screen. For the typical inland or coastal angler, these fishfinder/chartplotter combos have all the functions you’ll ever need. Two versions are often sold; a coastal model, with appropriate mid/high-frequency transducer and coastal charts, or an inland version with high-frequency transducer and inland lake charts. The price is often proportional to the size and resolution of the LCD screen. Affordable CHIRP sonars, the “cheap CHIRP” for the rest of us, are made for the inland angler, and are the newest on the market. 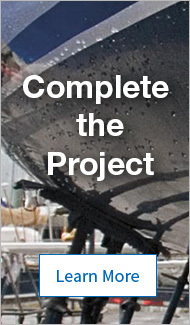 Various models come as a standalone fishfinder, sonar with GPS (but without charts), or a sonar/chartplotter including either inland or coastal maps. 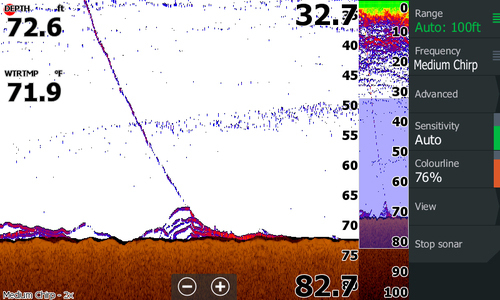 Whatever your price range, CHIRP sonar has changed the fishfinding game.